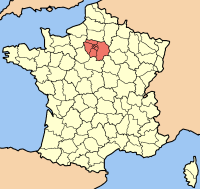 Île-de-France is a region of France. Its capital is Paris. In 2013 about 12 million people lived in the region. About 2.1 million live in the city of Paris. Paris as an engine of the global economy: the skyscrapers of La Défense, the largest purpose-built business district of Europe, with 3.35 million m² (36 million sq. ft) of office space. Île-de-France Facts for Kids. Kiddle Encyclopedia.